Just off the west coast of Scotland, in a narrow neck of sea between the north tip of Jura and the southern coast of Scarba, lies the third largest whirlpool in the world: the Corryvreckan. This maelstrom has been known and revered by mariners ever since humans first ventured into the rich and fertile waters of the Firth of Lorn. Irregularities in the sea bed, which include a 219-metre hole and a basalt pinnacle that rises to within 29 metres of the surface, cause violent eddies and whirlpools when the incoming tide is forced through the narrow Gulf of Corryvreckan. The strongest whirlpools form on the incoming tide, because the flow of water up the Firth of Lorn has already been squeezed through the Sound of Jura. On the ebb tide, water passes fairly smoothly through the Gulf towards the open sea. Strong winds and spring tides accentuate the effect; when the sea is being whipped by a westerly gale, a standing wave up to 15 feet in height can be formed, and the noise of the turbulence can be heard up to 10 miles away. The tidal flow can reach speeds of up to eight and a half knots. Perhaps not surprisingly, many legends have been woven around the swirling waters of the Corryvreckan. The best known story involves a Norwegian or Danish prince – sources differ as to his nationality – by the name of Breakan (also spelled Breckan or Bhreacan). Breakan was in love with a girl from a noble family; in fact, some sources claim she was the daughter of the Lord of the Isles. To gain the consent of the girl’s father, Breakan agreed to a test of courage which involved anchoring his boat for three nights in the Corryvreckan. Breakan sailed back to his homeland and consulted the three Wise Men of Lochlan on how he could win this challenge. The Wise Men were obviously of an imaginative disposition, and they advised him to have three anchor cables made: one of hemp, one of wool, and one that had been spun from the hair of maidens. Equipped with the prescribed cables, Breakan returned to Corryvreckan and bravely anchored his boat. On the first night, the hemp rope snapped, but the vessel was spared. During the second night, the wool cable was broken, but again the prince survived. On the third night, however, a violent storm swept across the sea and the last rope, whose strength lay in the purity of maidens’ hair, was torn apart. Too late, Breakan realised that the maidens were perhaps not as virtuous as they’d led him to believe, and both he and his boat were engulfed in the whirlpool. 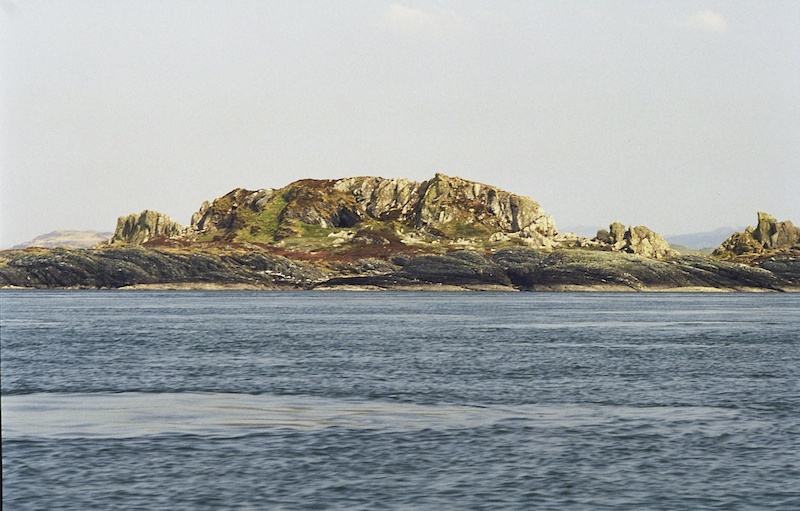 A crewman and Breakan’s dog swam to safety, and later recovered the prince’s body; according to the legend, he was buried in The King’s Cave on Jura. Another myth, this time of Scottish – or perhaps Irish – origin, tells of the Cailleach, who is known variously as a wise woman, the ‘veiled one’, or the hag goddess of winter. In autumn the Cailleach washed her ancient plaid of wool in the Gulf of Corryvreckan. The tumultuous waters of her ‘washtub’ made a great roar and heralded the first storms of winter. When the plaid was clean, it became pure white – in fact, a covering of snow – and the Cailleach spread it out to dry on the mountain tops. There are several boat operators who are experienced enough to navigate the whirlpool in calm weather. About 10 years ago we went on one of these, departing from Ardfern. Although it was a slack tide we were struck by the strange movements in the sea: the surface was irregular and uneven, as though spilling over very shallow steps, and in places it appeared to be welling up, like hot water in a saucepan, and boiling over into rapid whirls and eddies. As we ventured through the narrow strait, the skipper cut the engine for a few seconds and we waited and watched. 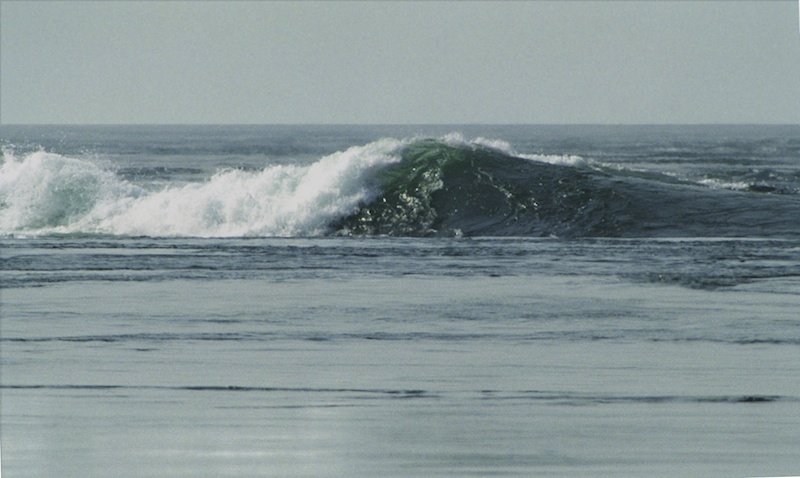 A standing wave appeared about 100 yards away, growing in height, curling but never breaking. Smaller versions began to form on both sides of the boat, and within seconds the engine was revved up and we were whisked away, out of harm’s reach. Local people have some hair-raising stories to share, including a local fisherman who suddenly found himself surrounded on all sides by walls of water, before both he and his boat were spat out of the vortex, luckily intact. In 1947 the writer George Orwell, who used a cottage on the north coast of Jura as a retreat when he was working on a novel, attempted to cross the Gulf in a small boat along with his son and two companions. Orwell misjudged the tides and the party were caught in the pull of a strong current which nearly wrecked their boat. Having lost the engine, they managed to paddle to safety on Eilean Mor, a tiny rocky island, and were later seen and rescued by a passing fisherman. According to reports, Orwell’s brother was the first person to swim across the Gulf. 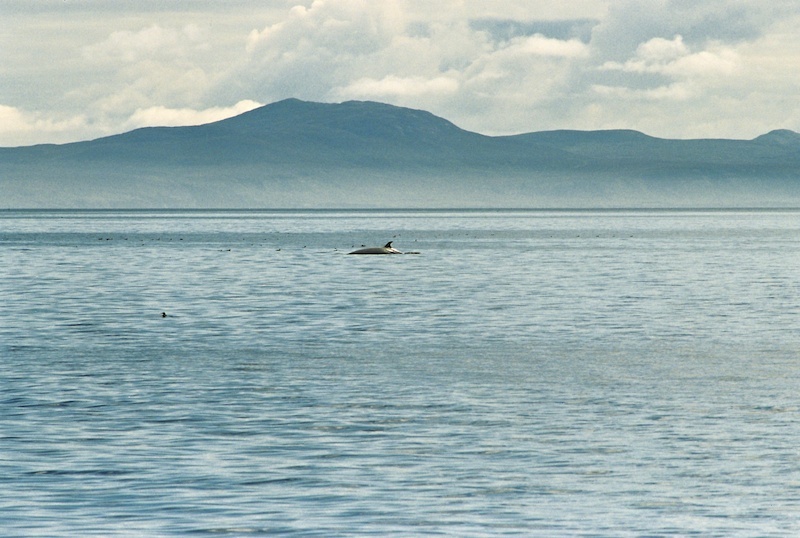 The waters of the Firth of Lorn are extremely rich in marine life, and the shoals of fish attract cetaceans such as porpoises and minke whale as well as many species of sea birds. Basking sharks can sometimes be seen passing through in the summer, their jaws gaping wide as they feed on plankton. 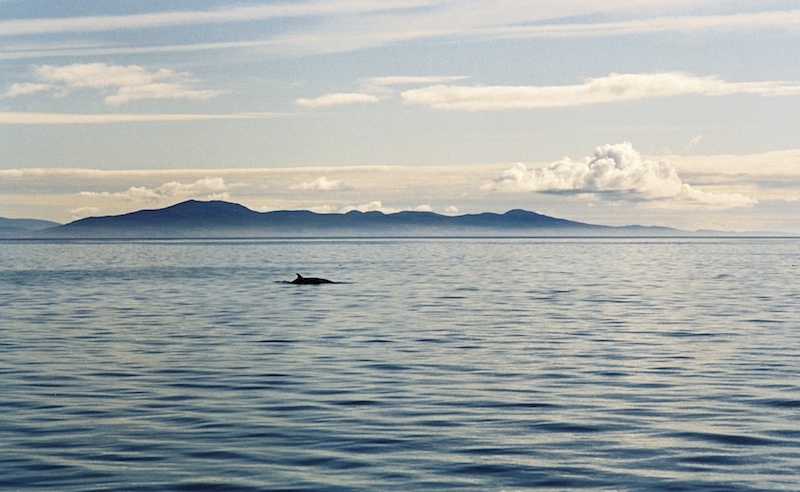 Some years ago we took a wildlife-watching trip up the Sound of Jura from the island of Colonsay. The weather was warm with just the hint of a breeze, and the sea was like a millpond. The cliffs of Mull were blue in the distance, and shearwaters were dipping and skimming all around us. As we sailed up the west side of Jura towards Scarba we were thrilled to see porpoises and at least two minke whales feeding around the boat; later, a pod of common dolphins rode the bow wave, taking it in turns to lead the way and allowing us amazing views of their faces and side stripes. The magic of those encounters is still fresh in our minds. Minke feeding in a surrounding ‘haze’ of fish! You can find more information about the Corryvreckan and its legends at www.whirlpool-scotland.co.uk. 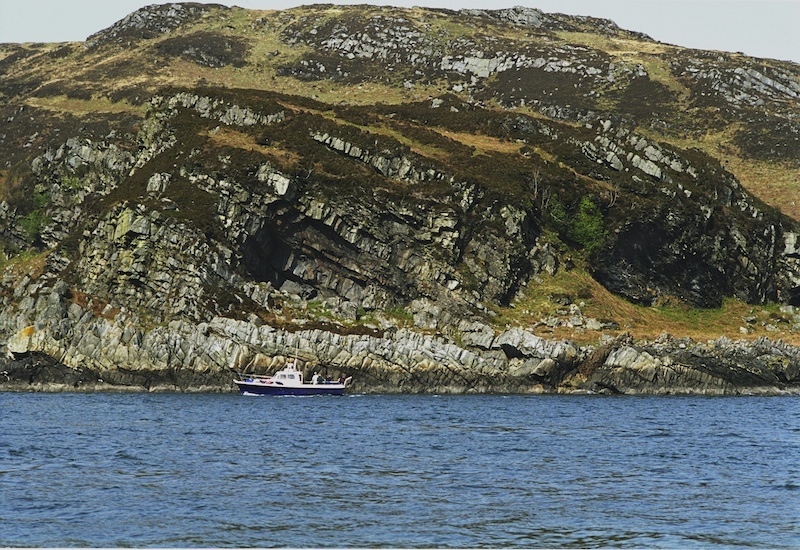 Boat operators offering trips to the Corryvreckan include Seafari and Sea Leopard. It always amazes me at what things there are out there in the world that Mother Nature has created, all so varied and different. Neat that I can view them via you. Thank you for that treasure! Really glad you enjoyed it – thank you! What a very full and rich post! The Corryvreckan whirlpool is a most interesting phenomenon. I’ve only seen it second-hand but I would like to do what you did and take a little boat trip out to it, your excellent photos have renewed my interest in it. I gasped when I read about all the cetaceans you saw on one day, how incredible! I can well imagine the memory staying with you, I still feel a thrill of excitement when I remember seeing cetaceans myself, for me it feels almost indescribably special to see them in their natural habitat. I remember seeing a pod of minke whales off Shetland swimming close to the boat I was on and I felt this strong and utterly ridiculous desire to jump into the water to be with them. I didn’t know about George Orwell’s brother, or about that close scrape in a little boat. As you always do so well, you’ve brought the most fascinating stories and legends to your post and I really enjoyed it. Thank you very much Lorna, that’s wonderful praise. I’m glad you enjoyed reading about the Corryvreckan – I would love to go back and experience it again, actually. We were so lucky that day, to see the dolphins and minke whales. It felt as if they were coming to see us out of choice. It sounds as if you’ve had some great experiences yourself, on board vessels in the North Sea – I’m not sure I share your instinct to jump in with minke whales but I know that Verity would have done so without hesitation! I’m sorry to say I haven’t seen many cetaceans. The trouble with the sort of work I’ve been doing is that it produces loud noises in the water and it’s been suggested that cetaceans don’t like that, although in fact they often draw towards it in places like the Gulf of Mexico, so no-one’s quite sure what’s going on with their reactions. I’ve never seen dolphins, which is something I hope to remedy one day because I think they’re incredible creatures. 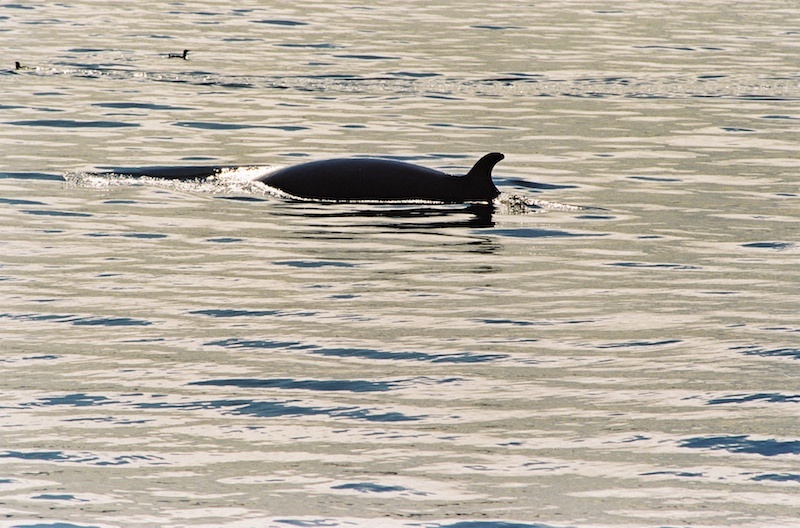 The first cetacean (a porpoise) I ever saw was from the ferry on the way to Lewis, but I think the minke whales I saw just off the side of the boat made the biggest impression because they were so close. One of my biggest dreams is to see Orcas in the wild, and I was quite envious recently when a friend who was working off Shetland rang me to say he’d seen a pod of them not far off his boat! I’d love to see Orcas too! 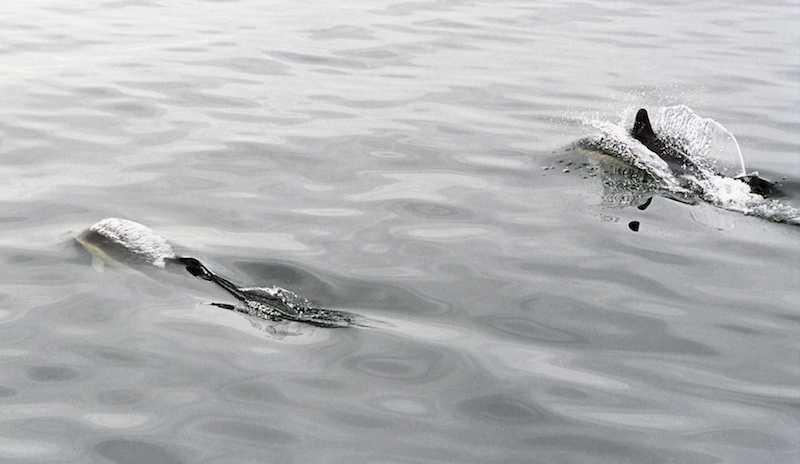 A friend of ours saw some in Shetland a few years ago, from the shore – a pod came into the harbour. We had some amazing sightings of dolphins in Oban Bay two years ago – there was a pod of them, youngsters as well, playing around the boats. And Leonie is perhaps the luckiest – from her kayak, she has had some amazing experiences of dolphins jumping out in front of her. Wow, that would be amazing seeing them from a kayak, you’d be so close to them! I’ve just remembered that I have in fact seen dolphins near Aberdeen harbour, but they were quite a long way off, which is why I think it hasn’t made a big impression on me. I’d love to see them close-to. I used to drive over the Kessock Bridge at Inverness quite a bit and always hoped to see them there but so far no luck. I think Shetland is one of the best places to view cetaceans in the UK. Sailed through it a couple of times…woh betide it if you get the timing wrong ! What a beautiful spititual place when the sun’s shining. That’s very true! It is the most beautiful place. Glad you enjoyed it – thanks for the comment! I had only vaguely heard about this phenomenon, so thank you for an interesting post. When I had an exhibition of my Hebridean photographs at the Royal Photographic Society in Bath I invited a group of Scottish dancers called Corryvreckan to the Private View. Now I know what it’s all about! Thanks for your comment – glad you enjoyed the post! WHAT GREAT SHOTS OF THE WATER AND THE WHALES. SO BEAUTIFUL!!!! THANK YOU SO MUCH FOR PRESENTING SUCH FANTASTIC SHOTS OF THE OPEN WATER AND OF THE DOLPHINS. THEY ARE SO VERY AWE-INSPIRING. !! Thank you very much (and for your previous comment) – glad you liked the feature. Nice job! Great photos and the bit of history of fantastic! Thank you very much, Mark. Beautiful and treacherous. Congrats on FP! It certainly is both beautiful and treacherous. Thanks for your comment! Lovely post and nice images! That could well be true – it certainly deserves that status. Thank you very much for your comment! Fascinating to learn about this, and thanks for the look at your wonderful pictures! Glad you enjoyed it – thank you for commenting! Thank you, Mikalee! Much appreciated. Thank you very much, and for re-blogging it! Wonderful story Jo, and congrats again for another Freshly Pressed! Thank you very much, Julie! Super photos Jo! I never knew these things actually exited, but thanks to you and you fantastic history lesson, I do now! The video you mentioned really brought your words to life! Thank you very much, David – glad you enjoyed reading about it. The west coast is a really beautiful and amazing place. absolutely beautiful images. i already wanted to visit Scotland and you are making it very difficult for me… i want to go! you really do the research, especially on something (which i dare say) hardly anyone has ever heard of! — and make it interesting (with photos to boot, especially for those of short-attention spans, like me!). george orwell, huh? 3rd-largest? but is it the “most enduring”? Thank you! Glad you enjoyed it. Most enduring whirlpool – I have no idea! Interesting question. Our daughter has kayaked through the Gulf too, guiding trips around Jura & Scarba. You need to know the tide times and weather patterns, and be able to read the currents. The coastline is just beautiful. Wow! I’d love to visit Corryvreckan. My Mum and Dad have been out there on the Waverley. The coastline around there is just beautiful. The Waverley still sails around the coast, and is very popular. Thanks for your comment! Thank you. I love the legends! I really enjoyed reading this. I live on Colonsay and have often sailed past the Corryvreckan on the Calmac ferries – I’ve never been able to see anything probably due to the miserable weather. After reading your article I’ve promised myself that one day I’ll go and have a look – but I won’t get too close! Great pictures too. What a lovely place to live – we really enjoyed our time there, it’s a beautiful island. I hope you get an opportunity for a boat trip soon! Thanks for your comment. Just another reason to go back and visit Scotland! I didn’t even know there were naturally occurring whirlpools out in the ocean! It seems there are quite a few but I don’t know about them all! I love the legends attached to the Corryvreckan. Thank you for your comment! Quite interesting, and wonderful photos. Thank you, glad you found it interesting. So do I – thank you very much for the comment. Fascinating, wonderful post! Another wonder place to explore in Scotland! Thanks for this wonderful info – and congratulations on being Freshly Pressed! Scotland has so many places to explore, it’s amazing! Thanks very much for your comment. God created and awesome world! It certainly is awesome. Thanks for commenting. I love learning about local folk tales and legends. Thanks for passing this one about Breakan along! Glad to hear that you enjoyed it, and thank you for commenting. Glad you’re inspired to visit! Thanks for the comment. The majesty of nature never ceases to amaze me. I’ve seen Orca on the west coast of Canada and Wright Whales and porpises and dolphins on the East Coast of Canada. Just like you, those are trips I’ll never forget. Those sound amazing experiences. Thank you very much for your comment! Love the photos, especially the information given about the third largest whirlpool. Really awesome post! Beautiful pictures. I’ve been twice in Scotland and it is a lovely place to visit. Stunning images. Thank you! It is a beautiful country. Thanks for your comment. This whirlpool features in the Powell and Pressburger film “I Know Where I’m Going!” (1945) but only as a special effect. It’s great to see pictures of it for real. Thanks for that – I haven’t seen the film, but I’ve heard of it. An amazing phenomenan; enjoy this blog post which capture so much wonderful detail. This is so cool! I’ve always been fascinated by whirlpools and other sorts of maritime irregularities. You seem to be very knowledgeable about the topic. Maybe you could do a post on rogue waves? Looking forward to the next post! I’m not sure I know enough about the sea to write about rogue waves, but I’m glad you enjoyed it – thanks for your comment! No wonder this place has so many legends, it seems unbelievably striking. I loved learning about it, thanks for the great post! Thank you – glad you liked it so much! Thank you for your lovely comment. The islands off the west coast are incredibly beautiful and I think stories like these make them even more special. I hope you can visit sometime! Thanks for following, Michele! Best wishes to you too. Beautiful photos and such an amazing moment. I don’t think I’ve ever seen this theme, I love it! Your background colour is awesome! Thank you very much for your comment on the post, and on the theme too – it’s the Lifestyle theme, which is good for a magazine-type layout. Amazing! We love visiting Scotland- been to long since we’ve done so. Thanks for educating me on this! Scotland is beautiful, and there are still so many places we’d like to visit, too. Hope you make it here soon! Thanks for your comment. That sounds like a challenge! The best of luck if you ever attempt it. Thank you very much for your comment! That’s a great idea. It’s only a (relatively!) small step across the water! Thanks for your comment, much appreciated. Thank you very much, Ron. What gorgeous photos! Your writing style is lovely. Especially nice is the bit of history you provide. What a surprise it must be to see those whales in their natural habitat! Thank you very much for the compliment, and I’m very glad you enjoyed the article. Yes, it was an amazing encounter – the kind that stays with you always. Very interesting post and wonderful photos! Thank you very much! The Gulf is well respected by local boat operators and yachtsmen (and kayakers!) – it’s essential to know the tides and pay attention to the weather forecast. 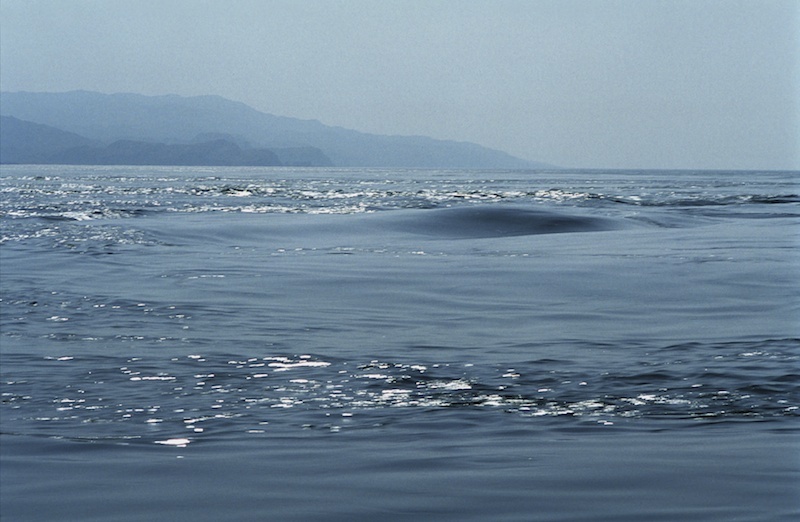 the shot with the minke whale …stunning! Thank you! The conditions were just perfect.